The Labour Party says it plans to reveal the names of people who give it commercial loans - as it fends off "cash for peerages" claims. The Tories quickly followed Labour in saying they would reveal details of future, but not past, lenders. Labour is trying to end the row over three men nominated for peerages after secretly lending Labour millions. Tony Blair has denied he nominated the trio for the House of Lords in return for the loans. But he told reporters at his monthly news conference he wanted a shake up of the honours system and the rules covering party funding, saying "the buck stops with me". He also stressed the three donors merited their place as working Labour peers in the House of Lords. It cannot be a barrier to a party appointment that someone has been a financial supporter of the party. The changes would include renouncing the right of the PM to nominate people for honours such as OBEs and knighthoods and instead pass that role on to the Cabinet secretary. They would not strip party leaders of the right to nominate working peers, something Mr Blair said was a question for any future reform of the House of Lords. The prime minister was speaking after Labour treasurer Jack Dromey launched an internal inquiry after being "kept in the dark" about loans to the party last year totalling millions of pounds. The rules on party funding dictate that anyone donating £5,000 or more should be named - but loans of any amount do not have to be declared. Labour has refused to comment on reports that it may have received more than £10m in undeclared loans last year. Details of the loans are expected when Mr Dromey reports on Tuesday about the results of his inquiry into the issue. Former Labour deputy leader Roy Hattersley said he reacted with "horror" to the reports. "It all demonstrates that the prime minister is too obsessed and too concerned with the world of money," Lord Hattersley told BBC Newsnight. He said the association with such money cost votes, even if it was spent wisely on campaigning. The prime minister said that of course Mr Dromey "should have known" about the cash. But he pointed out that in law it is Labour's general secretary rather than its treasurer who has ultimate responsibility for the party's finances. 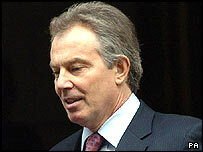 The changes proposed by Mr Blair also include appointing an independent figure to look into party funding. They will discuss with other political parties issues ranging from limits on donations, declaration of all loans and "enhancing state funding". The Conservatives welcomed the inquiry, saying the present finance arrangements were unsatisfactory. The Electoral Commission urged all parties to declare details of their lenders. The Lib Dems say they are already committed to declaring loans of more than £5,000 to the national party or of more than £1,000 to its local parties. The public administration committee is to summon the three Labour Party donors in question to appear before members. They are also to ask Blair adviser and fundraiser Lord Levy to answer questions. Tony Wright, Labour chair of the Commons Public Administration Committee, said there was a "loophole" which needed to be fixed: "Not for the first time in our public life it takes a scandal and a crisis to produce reform." Earlier Constitutional Affairs Minister Harriet Harman - who is married to Mr Dromey - decided to give up her responsibilities for overseeing House of Lords reform to avoid any conflict of interest.